This line of the family also from the same village as our own Giuseppe. The gravestone of Veronica Zaccarini 1850-1915. 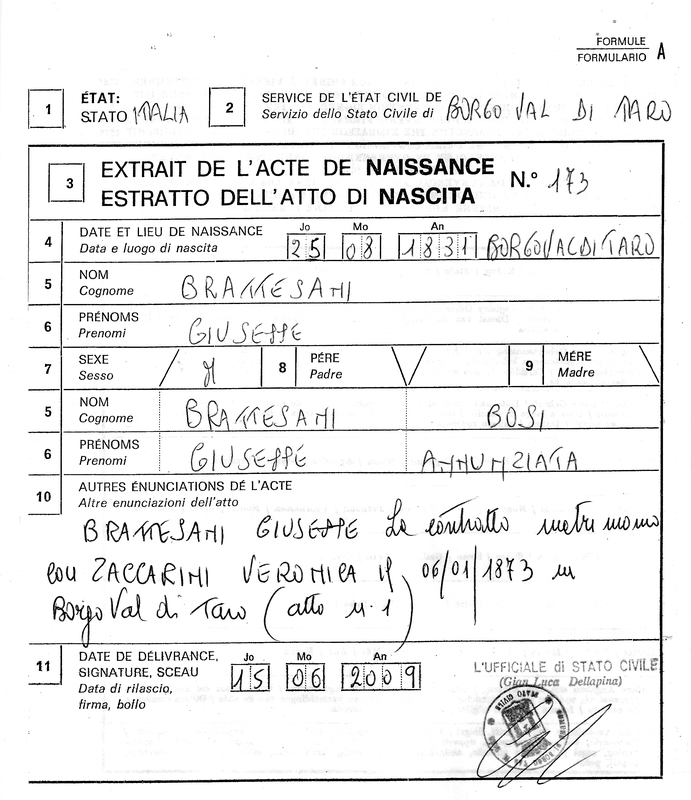 We must assume that it is her daughter Bettina Brattesani who shares her resiting place. 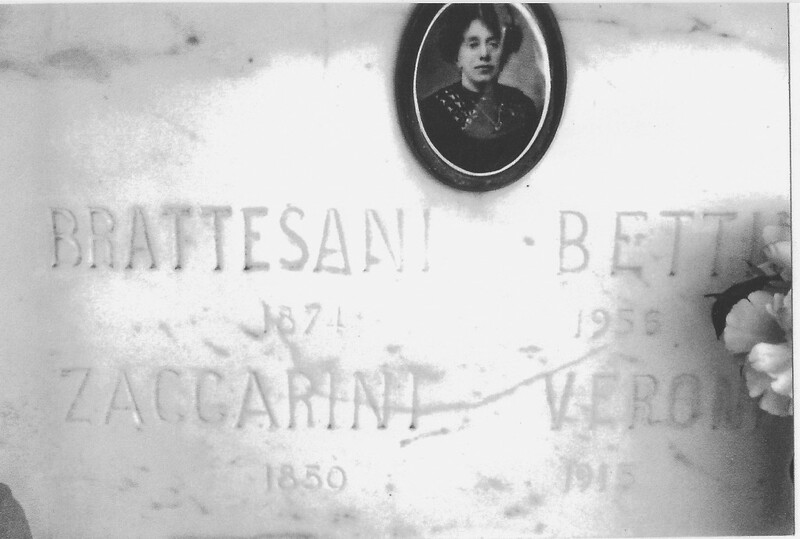 Giovanni and Veronica had at least three children, Bettina born 1871, Luigi 1880 and Giovanni.1891 Luigi stayed with his Brattesani cousins at 9 Greenside Place. In the year 1905 he ran a business from No. 4 Greenside Place in Edinburgh as well as another at 146 Dalry Road. He also resided at 142 Dalry Road in the same year. He then moved through to Glasgow. He married Emily Gorman and the couple ran a Soda Fountain Premises in Glasgow. They resided at 26 Cecil Street, Hillhead in Glasgow. When he died of a tumour in 1923 both his parents were still alive. 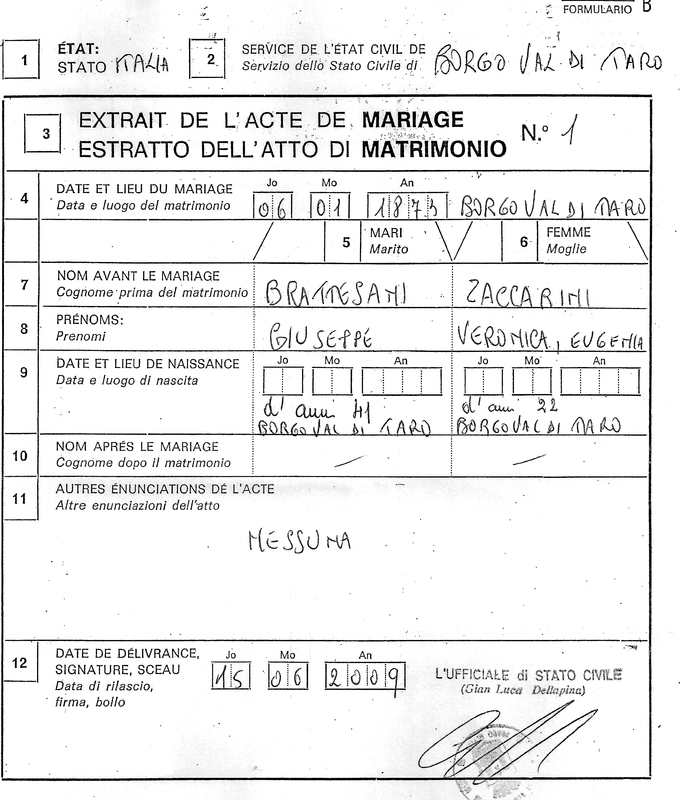 Giovanni or John was the only one of the Brattesani family to change his name. This branch of the family settled in Dundee in Scotland. He married Emma Jane Arthur in 1913. Emma’s address was given as 18 John’s Lane in Liverpool and Giovanni’s as Browning Hotel, Crichton Street in Dundee. John followed his cousins into the restaurant trade and ran fish and chip shops for many years. 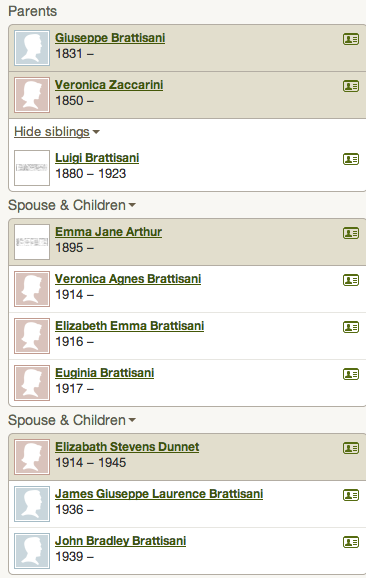 Daughter Veronica Agnes Brattesani was born in Durie Street, Methil on 1st February 1914. Daughter Elizabeth Emma came along in 1916. Emma died tragically on 17th May 1937 following a difficult delivery of twin babies. Eugenia was born on 28th May 1917 also at 4 Church Street, Lochgelly in Fife. Eugenia married Alexander Kingsepp in 1941. Alexander was 16 years her senior and a Marine Engineer by trade. By the year 1939 John and Emma had parted. His second marriage took place in St. Giles in Edinburgh on 10th November 1934. His new wife was Elizabeth Dunnett who was a hairdresser. John was 42 and Elizabeth 22 years his junior. But by the year 1939 at the outbreak of the War things became a little more difficult when Giovanni was interred at Saughton PRISON in Edinburgh as part of the Government locking up of Italians and Germans who had settled in the country. At this time he was running a hotel at South Queensferry under his new name as Bradley’s Hotel with his new wife. Another interesting interment was one of the Bosi family who were running a cafe in Union Place, Leith Walk, Edinburgh, just beside the Deep Sea Restaurant. Primo Bosi who was born in Scotland was arrested after they found firearms in his shop at 6 Union Place. Lawrence Bradley married Helen Seaton Purves on 16th September 1972 in Glasgow. – James Giuseppe Lawrence Brattesani above. Hello John and thank you so much for your comment. I will dedicate a page to your father and uncle if you would like to send me some details. i will try to gather some information on my grandfather ludovico brattesani who had an ice cream shop in elie fife 1936-1939 he was arrested at the start of the war and interned in the isle of man. his other two brothers had shops in anstruther, and leslie in fife but as far as i know he was the only one arrested because he lived in italy 6 months of the year. my father was born in leslie along with his 4 sisters and 2 brothers one of which died my namesake john died in elie when only a year old, hense my grandmother decanted back to italy. iwas born on the14th of august 1948. when my mother visited my grandmother in glasgow .